Though the Disney Rewards Visa card shines on Disney theme park perks and discounts, its rewards program leaves much to be desired. 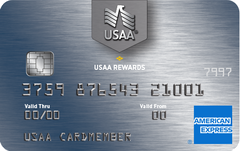 The USAA Rewards American Express Card offers a fair amount of points on dining out, gas and grocery store purchases, but beware of its APR, which can run very high. Frequent Maurices shoppers could save a considerable amount of money with the mymaurices VIP credit card, but its exceptionally high APR means those who don’t usually pay their balances in full every month should stay far, far away. The Victoria’s Secret Angel credit card is must-have plastic for die-hard fans of the lingerie retailer, but those who rarely patronize the pink-hued stores should steer clear. If discount department stores are your happy place and you love the idea of uncomplicated rewards and automatic redemption, the TJX Rewards Platinum Mastercard could be a good choice – but the card’s high APR and low overall rewards rate could be a reason to pass on it. This plain vanilla rewards card offers a low APR and standard benefits, such as travel insurance and extended warranty; but its bare bones rewards program won’t get you very far if you’re looking to quickly earn premier rewards. While the card’s 1.5 percent rewards rate is fairly high, cardholders can find far more rewarding cash back cards that offer large sign-up bonuses. A great card for large families, the AeroMexico Visa Signature card pairs a budget-friendly rewards program with family-friendly perks, including a $99 companion ticket and a free fourth ticket when you buy three tickets on the same flight. Designed for devoted fans of Gap Inc. brand stores, the Gap Visa card bestows cardholders with 5 percent rewards and special savings opportunities at Old Navy, Banana Republic, Athleta and Gap — but, unfortunately, not much else. The JetBlue card offers a fair rewards rate for frequent JetBlue travelers, and it’s the rare airline card without an annual fee. This offer is no longer available through our site. With an average sign-up bonus and a low rewards rate, the SKYPASS Visa Signature card is not a great choice for many cardholders; but frequent travelers to South Korea can eke some good values out of it. Fans of value-priced yet stylish clothes have the most to gain from the Old Navy Visa card, but the card’s paltry rewards on purchases outside of Gap Inc. stores leave much to be desired.